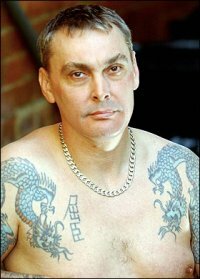 Actually, the danger is not in the tattoo itself, but in the tattooists. Unfortunately internet is full of "horror stories" about oriental tattoos which were guaranteed to have a certain meaning, and turned out to be totally different... next you´ll find some samples, mainly from www.hanzismatter.com, a website run by Tian Tang, dedicated to the misuse of chinese characters in western culture. 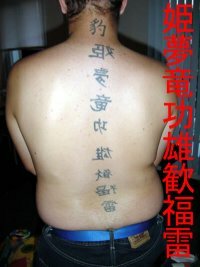 The greatest part of western tattooists does not know ideograms (hanzi in Chinese, kanji in Japanese), and does not even have an idea of how complex they are: it´s so easy to stumble upon mirrired or reverted tattoos, or even partial ideograms which totally lose their meaning. 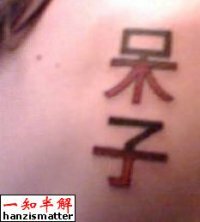 The other great half of wrong tattoos is even worst: ideograms are correctly inked, but their meaning is definitely not the expected one. One last important tip: do not trust "alphabets" which are claimed to translate names in chinese characters! Chinese ideograms are NOT an alphabet, and thus names can not be written by "translating" them letter by letter. What can be done is using ideograms whose sound recalls the sound of the letters, or syllables, but then... who knows what the results would be?!! They could be totally unpredictable! Once you have your model, check it get correctly tattooed, not mirrored or capsized, and as close to the original as possible: a few variations could totally upset the meaning of your tattoo, or just turn it into gibberish. You can also try and post your tattoo on www.hanzismatter.com before you get it done, to see if Tian can check it for you!